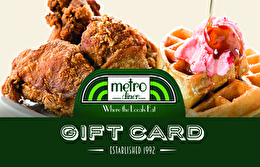 Metro Diner may not be the type of place where you'd expect contemporary culinary techniques, a commitment to creating dishes from scratch, an award-winning presentation, unique recipes and imaginative twists on old classics, but it is. It's that type of place because we cook with heart. We cook for the love of food. "745 Middletown Warwick Road Commerce Center @ Westown"
For balance inquiries call the phone number to a Metro Diner's location below.